Cheap home injection moulding machine in the EU? However, it is being made and sold in the US so buying and shipping it to the EU will be way too expensive for it to make any sense. So now my question is - does anyone here know of a similar system being sold within the EU? Edited 1 time(s). Last edit at 08/12/2012 10:17AM by marlaur. Re: Cheap home injection moulding machine in the EU? I'm working on an full auto, full electric and open source injection molding machine for shooting into cheap printed plaster/epoxy rapid mold tooling and aluminium low volume tooling. For now, [crclarke.co.uk] makes one in the UK. I bet it's not cheap. There's a huge gap in pricing between these "better" home shop machines and the first "real" machine with a screw. Do you have any work in progress you could share, or is it too early? And what kind of skills would be required to build it? I'll post a package of information in the appropriate forum and a link there once i have something that won't get people killed or cut limbs. I still have some stuff to do on clamping the platens together. Electric drives makes this quite a challenge when simplicity is the main target. A single, direct clamping hydraulic cylinder would be an easy workaround but hydraulics are neither exactly hobbyist firendly nor are they very safe in automatic operation unless done with experience. Arduino is the base of the electronics and the whole assembly can be made with a manual minimill. A screwless design with 5cm3 shot size and 50kN clamping is what I'm targeting. I'ts hard to say anything about skill level required, just some common sense with safety, basic operation of some measuring equipment and some basic knowledge of facing and drilling with a manual mill is required. These things are more brute rigidity and finesse in operation than complex machinery. About 2 weeks should do. toggle clamping is the easiest way of aquiring great clamping forces without too much effort from the positioning accuracy. But it's complex and, most importantly, making the whole system clamp with a reliable force minimum often brings one to FE analysis and highly expensive measuring equipment, which is quite not the point here. I wouldn't say normal toggle clamps for jigging are the most reliable when it comes to the upper end of the rated clamping force scale either. Normally a toggle clamping mechanism gives you a mechanical advantage of 15-30 times that of the capacity of the actuator used. Aka. I get out over 30 kN with a single 63mm pneumatic actuator at 6 bar or a ~3,7Nm stepper motor with some self locking screw type and a 6mm pitch, but you never know the clamping force with the system. You don't want to have melted plastic at 50MPa and more without something you can rely on to stop it. Something pneumatic or hydraulic is pointless in a DIY community. Only few have the equipment to operate such stuff. Unless your machine includes everything required, of course. zboz, that is exciting! I can't wait to see some results! Injection moulding my own product was my business and I still own a tiny hand operated machine. I have also built my own fully automatic Inj. Moulding machines and rebuilt the electronics for old ones (Austin Allens mainly). The machines I built were tabletop ones and took about 2 months of work. They are pneumatic operated with hydraulic lock. The compressed air pushed oil from a reservoir into the locking cylinders. The machines are still running today. If you want a "cheap" machine then it has to be a hand operated one. That could give you more than one moulding a minute. Because of the forces involved you would still need some basic engineering machinery to build one from steel. The mini machine I kept is a little cast iron one with a rack and pinion piston (like a pillar drill quill) and a hand clamp mechanism. It's an 'Asmidar Plastic Moulding Machine" , "APM" for short. They were made in the 60's. I think they were the smallest ones ever mass produced. Edited 3 time(s). Last edit at 01/23/2013 04:37AM by Marcx. It was bought in 962 and only used for a samples production of 1000 pieces; then stored. We recently discovered the device in our stock, well covered and packaged. I would sell the device for a fair Price. Actual Location: 74541 Vellberg-Großaltdorf (Southern part of Germany). If interested in further Information (images, details) please send me an email. I've been wanting to build or get hold of an injection moulding machine since I've found that a couple of my major design projects (modular rotary hydroponics, and 'wind-lens' turbine prototyping platform) could be most cheaply produced by moulding waste plastic into cast or milled aluminium forms, where I have put many replaceable repeating segments in those designs. 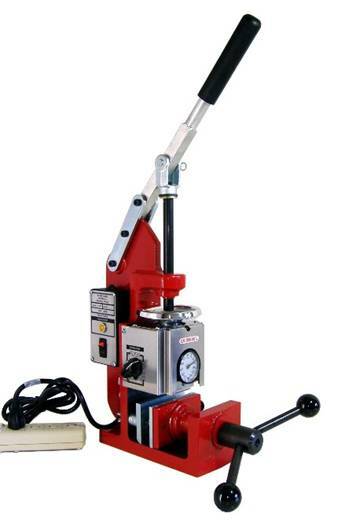 Having seen this kickstarter for a bench-top injection moulding machine, and seeing that the same group apparently offered a $500-600 version that consisted merely of a cylinder that you mount in a drill press along with a power supply. Unfortunately, neither of these systems is Open Hardware, so I don't know exactly what's going on with the internals. Both their first and second versions seem to be nothing more complex in operation than concentric hopper-piston-cylinder-nozzle, as seen working here and here. However, I learned little about the operation of these machines at uni, where they were treated pretty much as a black box with an auger in it that conveniently produced high temp&pressure plastic goo for a mould that we would be expected to design, but never expecting us to need the finer points of actually designing the machine itself. I understand from looking at Fig.1 of this patent for example that some commercial systems may incorporate a sliding valve at the nozzle, to prevent molten plastic from spilling out before it is needed to do so (what we here use retraction for on filament extrusion systems), and LNS' systems don't even seem to incorporate this, however I'm not completely sure what goes on at the other end of a piston system, specifically what happens to the air gaps between plastic pellets/nurdles poured into the hopper. Do the pellets all melt down into a pool before being injected, or do some remain in the cylinder floating on top as the piston shoves them down? Is a large air gap between the piston and the top of the melting plastic acceptable, and do air bubbles reliably rise out of the plastic so that they are not injected in such a system? I can get access to a lever/press quite trivially, but the piston/cylinder is where I'm stuck here. I want to mould some parts a with volume approaching or even exceeding 100ml, but high precision is not crucial here, so I don't mind the system using relatively low pressure and parts suffering from minor shrinkage. Would it be reasonable to get a 2-inch steel pipe, weld a plate onto one end with a threaded-fitting brass/alu nozzle, and use a 1cm thick cast or turned alu disc at the other end as a piston? Would a rubber (silicone?) o-ring be needed on the 'piston' (for a better seal)? Let me know if I need to sketch that for clarity. Edit: someone on RepRap IRC named Jonas found this bit of copyleft documentation on someone's home IM build. Instead of any kind of pipe, they drilled a hole through one large block of aluminium. Edited 1 time(s). Last edit at 12/15/2013 04:05PM by 4ndy.